If you’ve ever wanted to find a method that is simple and easily repeatable, try Method 4. Note: I recommend you check the images at the end of this part for a preview of what will be described. I switched to Method 4 a month prior to winning my last NHPA sanctioned tournament. Method 4 adheres to all that I consider important, i.e., simple repetition, pendulum swing, Line of Flight, Visual Alignment Point, fully extended arm, stride length and balanced delivery. As hard as I’ve tried, I have not been able to ignore any activity that exists behind the distant pit. Method 4 takes care of that problem as well. When I was trying to develop the geometry for this method I established a series of goals that I felt were important to encourage a simple series of steps that gave me the best chance of success. The following is a list of those goals in no particular order. Method 4 includes all of the goals listed. Utilizing fixed points on the approach. A simple and relaxed stance and body alignment. A pendulum swing with fully extended arm. Maintaining the shoulder relationship to the Line of Flight (LOF). Establishing a straight line between shoulder and stake. Establishing the stake as the Visual Alignment Point. NOTE: Your personal VAP may change, see further comment below. Moving the head directly at the stake. An early planting of the striding foot. 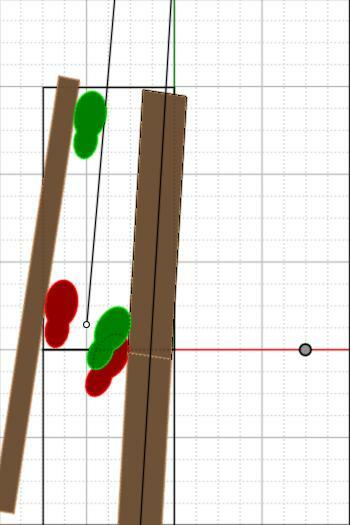 Ability to move geometry to any position on either approach. The setup, address and delivery described below adhere to the goals set above. I set up my practice pit as follows — use a 2″x4″x6′ and a 2″x6″x6′. Drill holes at the front and back of each board and use long galvanized gutter nails to secure the boards to the ground. Be careful — know where your electrical and phone lines are located. If concerned, pickup 6 plastic tent spikes from any store supplying camping equipment. Step 1 — Nail to the ground a 2″x4″x6′ board that runs along the left edge of the right approach 18″ from the stake (see below). Step 2 — Place an “X” 39″ from the foul line and 15″ from the left edge of the approach. Step 3 — Draw a cord from the stake passing over the “X” and anchored behind the right approach. This is the Line of Flight (LOF) cord. Step 4 — Slide a 2″x6″x6′ board centered under the cord and nail it to the ground. Step 5 — Mark where the cord passes over the front of the pit and anchor the cord just outside the pit. Eliminate the slack over the board. 1. Take your normal grip. 2. Place your left foot along the left edge of the right approach with your heel aligned with the stake at 36″ behind the foul line. In practice along the 2×4. 3. Place your right foot 12″ to the right of the left edge of the right approach. Angle it at 30 degrees with the ball of your foot at 39″ behind the foul line. 4. Rest the horseshoe against your right leg. In practice your right foot rests against the 2×6 and the horseshoe straddles the LOF at 39″ behind the foul line. 5. This Setup puts your upper body comfortably rotated clockwise. This completes your Method 4 Setup. The Address position is a continuation of the Setup position. The Visual Alignment Point (VAP) is the (right side of the stake)* from your viewpoint. *Comment: If using the stake as your VAP and the shoe continues to go left, you may need to move your Line of Flight and VAP rightward until your shoe arrives directly at the stake. Your physique may dictate that you naturally swing your arm a bit further from your body (broad shoulders). When you grip the shoe and rest the shoe against your leg, your arm should be at 90 degrees when the Center of Gravity of the shoe is directly over the Line of Flight. 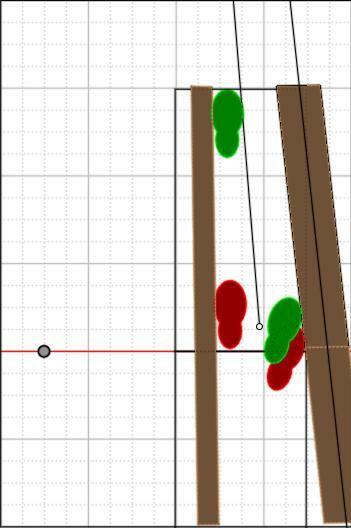 I recommend that you move the LOF rightward until your naturally hanging arm with shoe in hand is vertical over the Line of Flight. Secondly, adjust your new VAP rightward. The height of your VAP depends on the necessary height to insure that your striding left foot is completed before the shoe leaves your hand. Experiment with the height starting at the base of the stake and move upward. The Address position is completed when you raise the shoe to your established VAP. It is not recommended or necessary to keep your eyes on the VAP. You can swing your fully extended arm up to the VAP while fixing your eyes on the base of the stake. The lower on the stake you lock in, the less you see the activity behind the pit. I find 3″ from the base of the stake is a good neutral location. A little short or long keeps you in ringer range. From this position you would move to the Delivery phase. The Delivery is what makes this method unique. 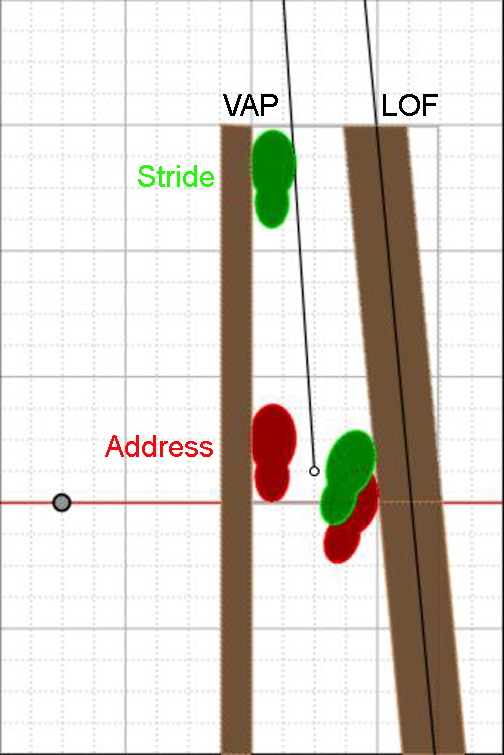 The green footprints below represents the completed delivery stride forward. For practice, make note of the fact that the left foot hugs the edge of the 2×4 and the right foot moves only slightly forward along the 2×6. The Delivery begins as follows. The downswing begins with a very slow bow to the stake. Your head and eyes move down the stake without any movement left or right. It is only necessary to drop the head by 3″-4″. Simultaneously the arm moves downward while still fully extended and the stride forward begins as your forward weight shifts with the bow toward the stake. This is a reactive movement based on your weight shift forward. The back swing continues until it reaches it’s normal termination point. As your arm passes the right leg it needs to pass as closely as possible to the right leg. Ticking your pant leg is a good thing as long as it does not upset your back swing. The next important aspect of this method is the quick plant of the right foot. Your right foot should not move more than 3″-4″ and end up on the ball of your foot. Think of your head as the compass and your right foot as the rudder. It is extremely important that your nose, head and eyes move straight down the stake during the forward bow. The left foot should end up against the left edge of the approach and slightly short of the foul line. Your right foot needs to follow the Line of Flight for a very short distance to keep your right shoulder over the Line of Flight. Completing your stride forward before you release the shoe allows you to establish your balance prior to releasing the shoe. A bonus discovery. 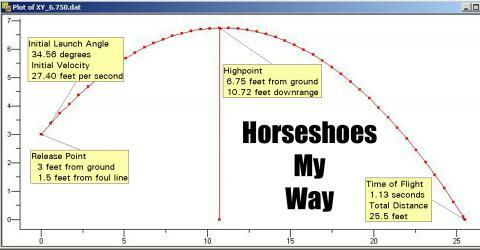 While practicing, I noticed that if I concentrated on keeping my right foot planted and only raising up on the ball of my right foot during delivery, the horseshoe arrived higher on the stake with a higher drop angle. I used this technique a number of times during my last tournament to drop the shoe in from a higher angle and over a blocking shoe. Using the left or right approach is a personal choice, however, if you are a flip pitcher your shoe will arrive more squarely from the left approach over the right. If you are experiencing too many bounce backs, consider moving to the right approach. 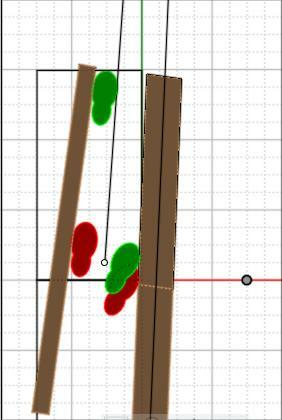 A shoe that arrives from the left approach tends to rotate clockwise when it hits the stake, while a shoe from the right approach tends to rotate in the opposite direction. This is important if you pitch in sand. Many times a shoe that comes in from the left will rotate around to the back of the stake and can be knocked backwards from another arriving shoe. If you pitch from the right approach and move your thumb rightward on the thumb calk, or even to the right of the thumb calk, your shoe will arrive more clockwise and reduce the tendency to rotate behind the stake. Experiment with the reaction of the shoe when in sand depending on whether it is wet or dry and how fine the consistency of the sand. I designed the Warrior (USMC) to have an arc shaped thumb calk to allow the thumb to rest squarely on the thumb calk when placed to the left or right. If gripped to the right side, you can still pass the shoe close to your leg while a shoe gripped on the left side will tend to cause the left hook calk to hit your leg as it passes by. Continue to Part 48 for a complete description of “Drop Angle”.